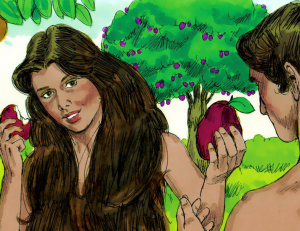 What’s With All the White People in Kids’ Bible Story Books? It finally happened. I was teaching a children’s Bible class of 3rd-5th graders, when one of the boys said something like, “I can’t be descended from Adam and Eve, because Adam and Eve were white.” I thanked him for bringing that up and used his comment as an opportunity to address the fact that although Bible story books almost always depict Adam and Eve as Caucasian, the books are simply wrong. 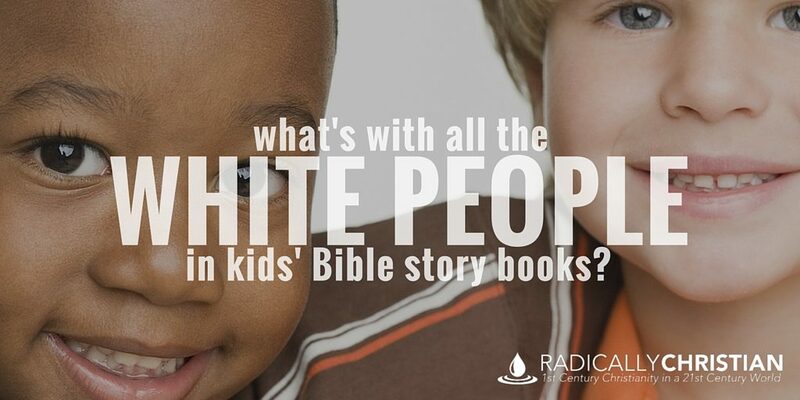 I’ve been saying for years, we need to stop illustrating everyone in the Bible as white. 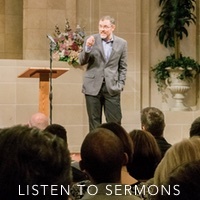 One of the major themes of Scripture is that the entire human race is descended from Adam. Not only does Genesis teach this, so does Jesus and so does the apostle Paul. In Athens, Paul said that God “made from one man every nation of mankind” (Acts 17:26). Simple genetics tell us if Adam and Eve had both been white, then no matter how many offspring they had, all their descendants would be white. Since mankind is obviously made up of many different skin colors, Adam and Eve could NOT have been white. Adam and Eve likely had a “middle-brown” skin color (source). Many centuries after Adam, a man named Noah came on the scene. The account of the flood tells us the human family was reduced to eight people: Noah, his wife, his three sons, and their wives. Again, if all eight of these people were Caucasian, the entire human race would be Caucasian. It’s possible that those eight people were diverse in skin colors. Wouldn’t that be absolutely fantastic to see a children’s Bible story book depicting Noah’s family as “interracial”? If that offends you in any way, perhaps you ought to remember what the story of Noah is all about. It is about the interracial human family being saved through those eight people. Adam, Eve, Noah, Noah’s family, and the rest of the people in Scripture were real people. We don’t know what they all looked like, but surely we know they weren’t all white. To depict our ancestors as all white people is not only inaccurate, it also has unintended consequences. My entire life I’ve seen people insist on accuracy in children’s Bible story books; everything from the animal that swallowed Jonah to the way in which Noah’s ark is depicted. I think it’s great that we try to make our children’s material as accurate as possible. But when it comes to the issue of skin color – even when people are presented with the truth that people like Adam and Eve could not possibly have been white – very few people seem determined to set the record straight. They seem to care more about accuracy in other areas than in this area. Many seem more concerned that the fruit in the Garden of Eden is always depicted as an apple, than about the fact that Adam and Eve are always white. Shouldn’t we be more concerned about helping “all the children of the world” know we are all part of the same human family? Isn’t that more important than some of the other details over which we often stress? I don’t know how much it really matters if kids understand what the ark looked like, but I know for a fact it matters that children understand Noah’s family is our family – the human family. All children – “red and yellow, black and white” – need to know they are part of the human family who was created by God through Adam. They need to know they are part of the human family who was preserved through Noah. They need to know they are part of the human family for whom Jesus died on the cross. Racism continues to divide us and we need to do a better job of helping young children understand we are all part of the same human family. We all came from the same people. We were all created by – and are loved by – the same God. What Should We Do About It? I am not saying there was any maliciousness in the way illustrators have depicted Adam, Eve, Noah, and others over the years. I think it was done innocently enough. I think most people just didn’t know, or didn’t ever stop to think about it. But just because it was done innocently and in ignorance, does not mean it is ok for it to continue uncorrected. When I was a youth minister, I took a group of teens to a stage production of “Noah” in Branson, Missouri. After the show I asked the teens if they noticed anything wrong with the play. They mentioned a few things they thought were doctrinally skewed. Then I asked them, “What did you think of the fact that everyone in the play was white?” I don’t think they had ever considered that before, but it gave us the opportunity to talk about the issue. Of course it would be better if we would change the way we illustrate Bible story books and children’s curriculum, but in the meantime, we can use the inaccurate pictures to start conversations with young people and set the record straight. One way or the other, we have to help everyone realize the Bible is about the Creator’s relationship to the entire human race, not just one group of the human race. The above ads are serviced by Amazon. Please report any ads you see that are inappropriate.